The red variety of Corundum (blue corundum is known as sapphire), Ruby is a powerful heart stone, opening and activating the Heart chakra. 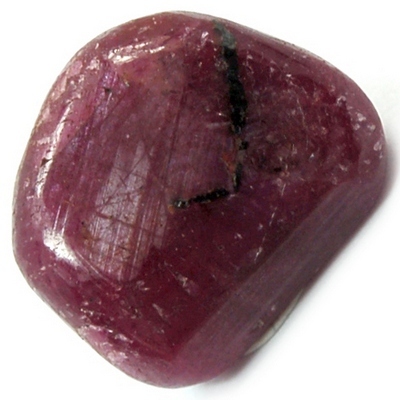 Ruby protects against the loss of heart energy, and dissolves emotional congestion. A powerful healer, Ruby heals and balances emotions, making the holder more emotionally aware, as well as helping them to connect to others emotionally. The intense and vivid energy of Ruby stimulates loving emotions, helps with the expression of love, and can facilitate states of passion and bliss. Ruby helps us to see the true nature of love, and reveals the Divine Love in everything in the Universe. Using Ruby can help you open up to and receive this Divine Love, as well as become a vehicle through which Divine Love can flow to others. Ruby helps to gather and amplify energy, aiding in opening the doorway to spiritual knowledge. Ruby is a wonderful stone for students as it stimulates deep mental concentration. Physically, use Ruby to warm the extremities, increase circulation and fight infection. Ruby is beneficial for male impotence as well as female infertility. It helps with perimenopause symptoms and balancing menstrual cycles. Click here to see Ruby in our online catalog.